The 56 Minor Arcana in the 78-card tarot deck are the precursors of our modern playing cards. The four suits in the Tarot (Wands, Cups, Swords, and Pentacles) are now called Clubs, Hearts, Spades and Diamonds, respectively. There are four face cards in each suit of the Tarot, and in the modern playing deck one of the face cards has been eliminated. If you look at the games we play with modern cards, you can see the through-line from the Tarot card’s meaning. The Queen of Spades is the worst card to get when playing Hearts, and the Queen of Spades is The Old Maid. 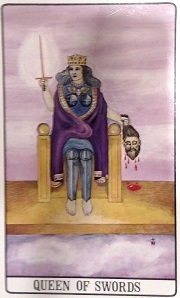 Her Tarot-based reputation as a heartless or solitary woman dates back at least 500 years, to the popularization of the Tarot in southern France.